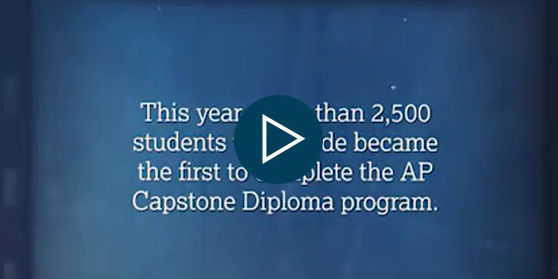 Offer the AP Capstone program in your school. Schools must apply and be approved to offer the AP Capstone Diploma program before they can offer AP Seminar and AP Research to their students. That’s because these skills-focused courses are different from other AP courses in many ways, including exam structure, exam scoring, and training requirements. We want to make sure your school understands these expectations and has the resources needed to support implementation. In-person training: Teachers must complete a five-day workshop the summer before their first year of teaching the course. Annual online rubric training: During the school year, teachers must also complete online training modules on scoring student work. AP Capstone helped me work independently, think critically about research and the research process, and organize myself so I can present to other people. What are the requirements for teachers of AP Capstone courses? Are there prerequisites for students? Get the answers to these and other questions about the AP Capstone program. See key dates and deadlines for schools applying to offer the AP Capstone Diploma program.